As of today, this ticker is accurate. I tried the KP Options needles last night--LOVE THEM! Want to buy more of them, but they are currently sold out! If you haven't gotten yours, go buy them this weekend...when they get more in stock. I hope you all have a safe and happy long weekend! They spent a lovely couple days in Grove City, Ohio then spent another four days just hanging out in Atlanta. I got them today. I don't know what all that sitting about is, but that's what you get with free shipping, I guess. Some of the gals on Knitty said they had their orders within a matter of days--free shipping. I must say that I like the look of these needles, and they feel so slick! I've not had a chance to give them a test knit yet, but tonight we'll spend quality time together. I love the case that they come in, too. Some people had mentioned that they smell, but I don't notice any odor at all. I am planning to buy the larger size needle tips. I don't use them very often, but you know, when you collect something, you should have all the parts. I might get more cables, too. I didn't have anything to say today, so I thought I'd steal this from Theresa. Feel free to steal it yourself. 1. Who was your best friend? Shawne, Anne, and Scott. 2. What sports did you play? Marching band is a sport, right? 3. What kind of car did you drive? I didn't have a car. My parents drove me to school. 4. It's Friday night, where were you? During the fall, at a football game, because I was in marching band. (Same answer as Theresa.) Any other time, I was either at home or "cruising Jeffries" with Shawne. We'd drive up and down the "main drag" (you small town folks know what I mean) and end up at Sonic, Dairy Land, or some other hang out. 5. Were you a party animal? No, I was a good girl. 6. Were you considered a flirt? Of course. It is genetic. I can't help myself. 7. Ever skip school? No. 9. Were you a nerd? No, but I wasn't one of the "in crowd" either. I was a poor, country kid. 10. Did you get suspended/expelled? If I had, I would not be alive to write this blog! My parents would have killed me. 11. Can you sing the Alma Mater? "In our hearts in Carolina stands our school so dear. And to you, dear John C. Calhoun our hearts are always true...." That's as far as I can get. 12. Who was your favorite teacher? Mrs. Blocker, my English teacher. 15. School mascot? We were the WarHawks. John C. Calhoun himself was known as the WarHawk. 16. Did you go to Prom? Yes, I did. 17. If you could go back and do it over, would you? Dear God, NO. 18. What do you remember most about graduation? The party afterward. 19. Favorite memory of your senior year? Making National Honor Society. 20. Were you ever posted up on the senior wall? Huh? 21. Did you have a job your senior year? No. My parents always said my job was getting a good education. Since they were forking over money for a private school, I think they were correct. 22. Who did you date? No one. 23. Where did you go most often for lunch? The only choice was buy lunch in the cafeteria or bring it from home. 24. Have you gained weight since then? I've actually lost a bit since then. 25. What did you do after graduation? I went to college. 27. Senior picture:I don't have one. I'll try to scan the yearbook photo later. I've decided that the work week is like a giant roller coaster ride. I really don't like riding roller coasters. Monday and Tuesday, you are clack, clack, clacking up the hill. By Wednesday, you're at the top, and about to take the plunge. AHHHHH!! You're still screaming down the hill on Thursday, but manage to catch your breath again on Friday. Saturday and Sunday bring you back to level ground, but on Monday, the whole ride starts again. Some work weeks have a lot of that screaming down hill bit. This has been one of those. You know, I hear a lot of dumb things--at work, on e-mail lists, on discussion boards, on the news, etc. For some reason I've yet to figure out, we watch the Fox network local news at 10 PM. Maybe we are just too lazy to switch the station to another local 10 PM news. The anchors of the news are a farce. They try to be cute with their comments, but it just isn't working. Last night, it was one of the interviewees who took the cake for stupid. Our area is currently experiencing a drought. It's typical around here this time of year. People on municipal water systems are under outdoor water use restrictions, same as they are every year. That means that people can only water their yards, wash cars, etc. on specific days of the week. Last night the news interviewed a woman who said, "I don't know why I can't use as much water as I want to as long as I pay for it." Can you believe it? What part of "drought" does she not understand? When there are drought conditions, the water supply is limited. I don't care if she has the bank account of Bill Gates, no amount of money is going to magically produce a bigger water supply. Hey, lady. Here's your sign. Husband dear, good ID on the frog. I'm up for sitting up to listen to frog calls whenever you want. How about tonight? turtlegirl, we have spoiled birds here who only eat black oil sunflowers. This may be one they dropped. It's so pretty! Judy, the human sock knitting machine, I hope you like your needles. I ordered some DPNs, too. I think they have small size circs, but not in the set. Lissa, I know what you mean about too worn out to blog! I've been too worn out to post pictures. Anonymous, Glad you liked the blog! A job offer at 13?? Amazing isn't it? Daughter has been working as a Counselor in Training (CIT) at her school's day camp this summer. The camp directors told me yesterday that they are ready to offer her a job when she turns 15. Apparently, she's doing a very good job. Little kids love her, and she likes them. How cool. It's really neat to see your kid suddenly in charge and being the caregiver. *sniff* She's growing up so fast. OK...it's back to work for me. You guys have a lovely weekend. Think of me here pulling up carpet and looking for more hardwood flooring--it's there, I know for sure. Patience is a virtue, you know. Readers of this blog have to have patience--patience while waiting for me to update; patience while waiting for me to share pictures; patience in putting up with my opinionated political rantings. Well, today, you get the picture....literally. Here are some pictures we've taken around home. First, meet one of our little friends who has taken up residence on the deck. I'm not sure what he is. 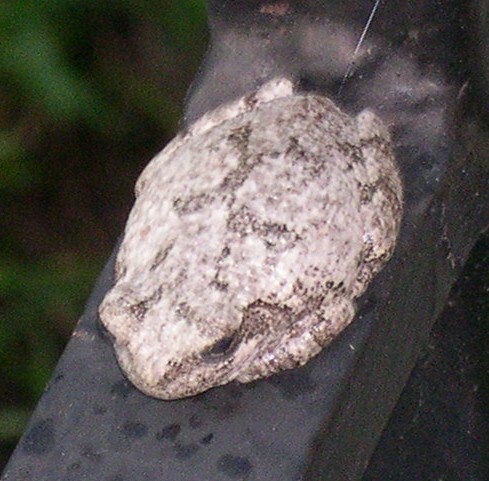 Husband said he was a barking tree frog, but the descriptions I see on line say that type frog is green. Who knows. Husband is very smart and usually knows his stuff. (He also reads this blog, so I have to say nice things about him.) The photo is blurry. I had trouble focusing it and didn't want to scare Mr. Frog. 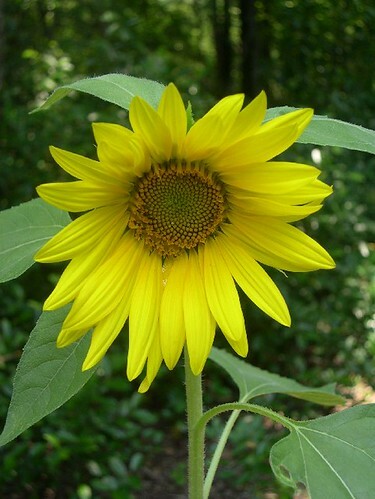 Here is a sunflower that came up in our back yard near the garden. I'm not sure if it was planted by a human or an animal. Isn't it pretty? Speaking of the garden, my how our little garden has grown. We've already been enjoying squash, eggplants, peppers, and cucumbers. The tomato vines are loaded but no fruit is ripe yet. Finally, here is a picture from our beach trip last week. How on earth did my camera hog child, the one who used to pose for us as if she were a model, the one who started grinning at the site of a camera....how did she suddenly become camera shy? This is about the best I managed. Notice the black shorts worn over the bathing suit. Apparently Miss Thang hates her thighs. I would give my right arm to be 13 years old and have the incredibly toned legs (including those thighs!) that she has. Girl, enjoy them while you can! God forbid one day you are 41 and have cottage cheese thighs like your mother! I've had a lot of comments lately. I'll address some of them, relying on the old memory! Someone said that I could possibly use the Joann's coupon to buy my Cricut machine and just get 50% off the regular price. Well, Joann's hasn't had the Cricut on sale. Their coupon specifically says that you cannot use it on that item, so I'm just out of luck there. Michaels will not honor their discount coupons on anything other than non-sale items, so again, out of luck. I bet you anything if they ever take the Cricut off sale, they'll put a disclaimer on the coupon excluding Cricut. Lissa has visited twice now in the past couple of weeks. Hey, Lissa!! I miss you. When you get back to blogging, please leave your blog address. I lost it. OK. That's the end of my memory. It just isn't what it used to be. It's all Vera's fault! After all, she's the one who posted about these. Of course, I then had to go search out as much information as I could on them which I found here. And, as they say, the rest is history. My set of needles was ordered last night by my dear enabling husband. When I started knitting some many moons ago (about 4 years now, I think it is), I was suckered in by Denise interchangeable needles. Putting it mildly, I hate them. They feel cheap and plasticy to me, but go figure. They are cheap (relatively speaking) and they are plastic. Next up as far as interchangeable needles go, I bought Plymouth bamboo. Love, love, love them!!! That was money well spent, and I think we now have 3 sets. I also bought the Boye set using a coupon at Michaels, because I like metal needles. The needles are nice enough, and the joins stay together as long as you connect them using the tools provided in the kit and follow the direction. Still...they are not Addis, and Addis are my favorite. I'm hopeful that the Knitpicks needle set will be more Addi like, because if they are, they may become my favorite interchangeable needle set. I know this will come as a shock, but I've not knit one stitch in probably 2 weeks. I'm just off my knitting for some reason. I took Picovoli to the beach thinking I'd knit, but no....Well, you saw what became of our relaxing Saturday night in yesterday's post, so are you really surprised? I've also not scrapbooked in a few days, but I did manage to purchase more scrapbook supplies. We found a neat little shop in HHI that had a small collection of materials--all great quality and nothing like I'm finding at home. We stocked up on some really neat looking beach type paper (some that looks like rippled sand, some that has sand dollars all over it in natural colors, and some that was specially made for HHI). We also found beach stickers. Believe it or not, we've been hard pressed to find beach stickers here at home that were not cartoonish. We live only about 2 1/2 hours from the beach, so I don't get that. What have I been doing with my time? Besides the usual work and chorse, I've been reading. I finished Eragon last night. If you like fantasy/mythology/magical type books, I recommend this one! It was excellent, I think. I had no idea that it was written by a 15 year old boy! He was 15 at the time he wrote it, and I think he's in his early 20s now. I also didn't know that the book is being made into a movie due out in December! 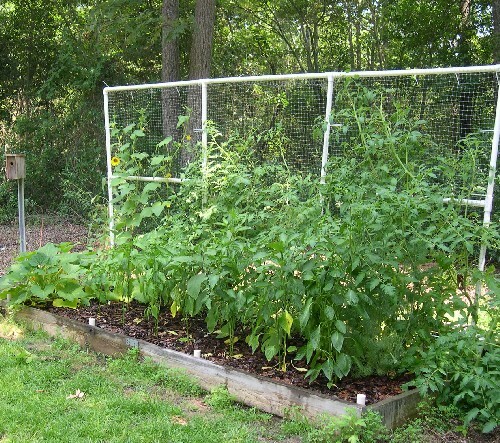 Our garden is growing well. I have some photos here to post, but I need to get the USB port on the computer working properly before I can do that--maybe tomorrow. I also have a few photos from our weekend trip. The title pretty much sums up our weekend. We took of on Friday afternoon for a relaxing weekend at Hilton Head. As I relate this story to you, keep in mind that we own the condo, so we're responsible for all repairs. Saturday morning, we figured out that the ice maker in our place wasn't working. We switch it off before we leave each visit, and I'd turned it back on about 9 PM Friday night. The thing was leaking from the bottom and freezing a little sheet of ice in the ice bucket. No biggy...we just filled ice trays. Husband plans to take the ice maker apart next time we visit and see if he can fix it. About 5:30 Saturday morning, I heard keys in our door lock and someone fumbling around. I got up, and told the guy standing there to move on because he was at the wrong door. No, I did not open the door to him. He came back about 15 minutes later, and by then I was working up a good scared. I again told him to move on and called security. They patrolled the place but didn't find him. Likely, he was drunk and lost in the villas. All the buildings look alike. It still was scary, and I got out of bed at that point. We had a great day Saturday with a beach walk and some pool time. The weather could not have been more perfect--blue skies, balmy breezes, and nice temps. We went out on Saturday afternoon to do a couple of errands and came back hungry and ready to cook dinner and put our feet up. Husband couldn't get the door open. What? Let me see?? Surely, he must have been doing something wrong. We tried for about 15 minutes but could not get the lock to budge. So....off to the hardware store to buy a drill (for drilling out the lock) and a new set of locks for the door. We'd been meaning to change them anyway. I think it took close to an hour to get in. So much for relaxing evening. We didn't even get dinner until 8 PM. I don't think anything happened on Sunday. We had more pool and beach fun and headed home mid-afternoon. However, this morning, it started again. My Explorer has a flat. I'm talking flat to the ground, flat as a pancake flat. I'll call AAA in a bit to see if they can come over and at least take the tire off. *sigh* Do I dare say "What next?" I've dreamed about my dad for the past two nights. Wednesday night's dream had him at a distance, standing in my backyard. Last night, I dreamed I walked into Mom and Daddy's house and he was standing there. Tears started streaming down my face, and I ran to him, hugged him tight, and didn't let go. I would give anything to be able to actually do that again. Daddy passed away in September 2000 after fighting cancer for a year. There is not one day that goes by that I don't think of my dad and miss him horribly. I've been blessed to have the most wonderful parents in the world, and losing Daddy changed my life forever. I will never be the person I was before he got sick. Something is missing, and I can't get it back. There is so much I'd like to share with him. I wish he could see the young woman his little grand daughter is becoming. For those of you who have both your parents living, cherish them. Even when they annoy you, interfere and try to tell you what to do, and all those other things parents do. Love them and be thankful every day that they are there. I want this. It retails for $299. Michael's has it on sale for $249. You know they have it on sale so that their weekly 40% off coupons cannot be applied to it, right? Husband saw one of these things in action a couple of weeks ago when he visited a Michael's store with his mom. The demo lady told them Michael's was the exclusive retailer for Cricut. NOT TRUE! I found out today that Joanne's sells this machine, and I have a 50% off coupon for Joanne's. I tell you folks, I was salivating....until I read the fine print. Joanne's won't let you buy any personal die cutting system with the coupon. Darn. I certainly can't justify spending even $249 on this thing right now, so I guess I will just wait until the price comes down in, oh, probably 6 months. We're getting some storms/clouds/rain from Alberto. The rain started last night and is expected again today. I'm not complaining. We were about to dry up and blow away around here. The grass, trees, etc. look like they are all rejoicing. We've not pulled out anymore carpet, but we did take a look at the back stairs. They are oak, and look to be in good shape. The landing at the back door is covered in a disgusting linoleum under the carpeting, but I think/hope it is oak, too. Sherry, I don't know why anyone would want wall to wall carpeting, either. I hate it, personally. I don't think you can ever truly get it clean, and it just harbors things that aggravate our allergies. I find a nice wood floor to be much more visually pleasing, too. There's been no knitting or scrap booking taking place here, unless you count spending money on scrap book supplies! Michaels had a big sale on their paper, and daughter and I stocked up. I went yesterday and bought 34 pairs of decorative cutting scissors. They were on sale 50 cents each with a regular price of $2 each. We are going to the beach this weekend, and I'm taking Picovoli with me. I really need to finish that thing. Did I mention that I was the "biggest loser" in our Curves diet class? It ended last week. I lost 12.5 pounds in the "6 week challenge" diet. Yay me! My prize was a set of those absorbent ceramic coasters. They are beige with an embossed sand dollar. I also got a mini coaster to go in the car for my perfect attendance award. Cool! Are there any other fans of the HGTV program Househunters out there? I love that show. If you've ever watched, I'm sure you've seen the prospective home buyer comment on the nasty carpet. Most of the time, the realtor comments that there's hardwood under there. That was true in the case of our home. We knew that the living room and dining room had gorgeous oak floors, because the former owners had them re-done just a few years before we bought the place. We also knew that there was oak in the hall and bedrooms upstairs. We didn't know how gorgeous it was until we started pulling carpet yesterday. WOW! Why anyone would want to cover such gorgeous wood with carpet is just beyond us. We pulled up carpet in the hall and one bedroom and are now working on removing the staples and carpet strip. That will be time consuming, but so worth it. The floors are in good condition, but we will have them re-done eventually. The downstairs is carpeted, too, and it's old stuff. Unfortunately, there is no beautiful oak floor surprise waiting underneath. We know that the floor downstairs is just plain old industrial looking tile--functional stuff. We plan to have the carpet taken up and oak floors put in down there, too. I remember Mom used to threaten not to let Daddy watch the news. It made his blood pressure go up because of the antics of local and national politicians. I think I know how he felt. I am angry and saddened by the latest antics of that fool in the White House. Have you seen this? He wants to make gay marriage unconstitutional. He thinks that "Changing the definition of marriage would undermine the structure of the family." I think he's full of crap. I'm neither a staunch supporter of gay marriage or an opponent of it. It just doesn't matter all that much to me. The fact that two women or two men love each other enough to want to legally establish a family together in no way harms me. "Redefining" marriage does not undermine my marriage or my family. "A vote for this amendment is a vote for bigotry pure and simple," said Democratic Sen. Edward M. Kennedy. I agree with that. Interestingly enough, Cheney doesn't agree with Bush on this issue. Cheney's daughter, Mary, is a lesbian. This is one time Cheney and I will agree on something. Enough of the heavy duty stuff. I snagged an alphabet die set for the Sizzix on E-bay this morning. The set is brand new and retails for $149. Including shipping and insurance, I paid less than half that! Yep, I'm feeling pretty good about myself. Daughter did a page last night and used several die cuts we made wtih the Sizzix. She did a fantastic job. I only got as far as cropping some photos. I'm still trying to come up with a good layout for some of our Ren Fest pictures. The knitting has been languishing as paper takes front and center for me lately. I'm also reading. Daughter's summer reading list came last week, and we made a trip to the library. I've read a couple of books from the young adult section and am currently in the middle of Jane Eyre. I read it many years ago and loved it! I want to get Wuthering Heights next. We also received a shipment from Amazon last week and have some good things there to read. The weather the past few days has been wonderful. Some may argue that point with me since we had rain and thunderstorms on Friday, but I happen to love that kind of weather. Besides that, the yard was burning to a crisp in spite of running the sprinklers. We needed the rain. I wish we'd get some more. It was a regular flight school in our backyard yesterday. I noticed several young birds who seemed to be testing out their ability to fly. There was something so ungainly about their movements but so beautiful at the same time. We've seen several pairs of birds--gold finches, chickadees, cardinals, tohees, blue birds, you name it. Surely there are lots of nests about and about in the woods surrounding our house. We also have baby bunnies and squirrels. I'm still waiting to see the deer. We've not seen her in a very long time, so I don't know if she's still around or not. MIL has loaned me her Sizzix die cut machine for as long as I want to use it. She bought it when the scrapbook bug bit her, and I don't think she's used it. I talked to her yesterday and she said that I could come go through her things and use whatever I wanted. I hate to take from her, so perhaps I'll just load up my things and go for a visit and some scrapbooking time. MIL likes to do crafty things like scrapbook and knit, but she likes to have company with her when she does. In that respect, she's much more social than I am! I don't enjoy going out places to craft with others which is probably why I don't care for the local "guild" meetings. I'd rather not drag my wheel and knitting somewhere to sit on a hard chair and try to do my thing when I can just sit home in the recliner and do it. :-) Going to MIL's house is different, though. She and my FIL have become like parents to me over the 22 plus years I've known them. They are good people and enjoyable to be around. They have comfy chairs, too! ha ha! Husband visited with them yesterday (they live an hour away) but he left so bright and early in the morning that daughter and I didn't get up to go along. He went to a wood turning meeting in the same area where his parents live, and it started at the ungodly hour of 9 AM. That's just too early on a weekend morning! Daughter and I had a nice time together and went to, where else, the scrapbooking store. Exciting news! My baby girl is going to her first formal dance this coming year! In our area, it's a tradition that the young ladies and young gentlemen attend social etiquette and dance classes starting in sixth grade. I know, it's an old south thing, but what's wrong with that? For sixth grade, the kids do not have to have partners, because the classes are just focused on etiquette. However, dance begins in seventh grade which means partners are needed. Little did I know that you should find a partner in kindergarten! (We're not originally from this area.) We had no luck finding a partner last year, so daughter had to sit this one out. Fortunately for us, one of her close male friends found himself in need of a partner this year, and Daughter was number one on his list. I think they'll have a good time together. They enjoy each other's company. This young man is the same one who attended the Ren Fest with us a few weeks back. In December, there is a semi-formal dance. I'm not quite sure what equates semi-formal in this case, but we'll find out. The spring formal, complete with tuxes and long gowns, is held in early May. Exciting! They didn't have things like this where I grew up.